As I was researching my PCC Streetcar I kept on coming across two blurry sepia tinged images of one of the earliest streetcars in Kansas City's transport history. 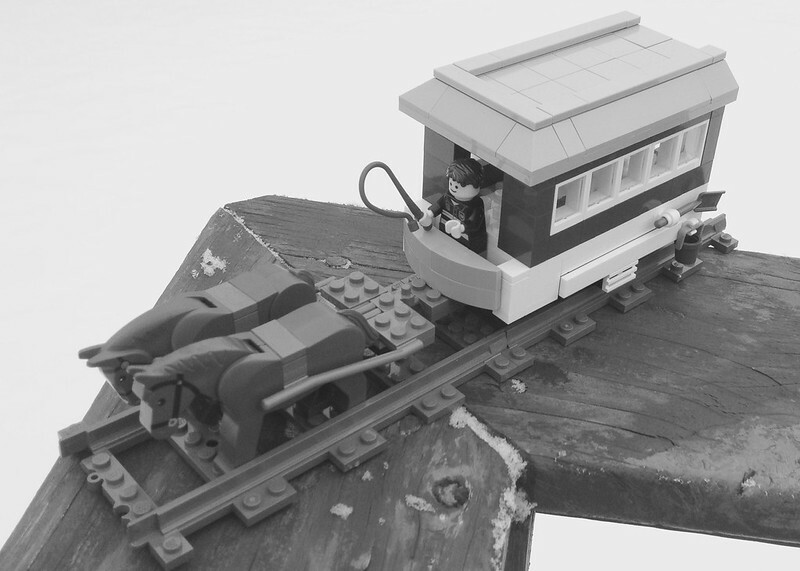 So before I could build the latest KC Streetcar (a UBOS 3) I knew I had to build a MOC of this. I had no idea as to the original color scheme so I decided to abdicate and take black and white pictures. 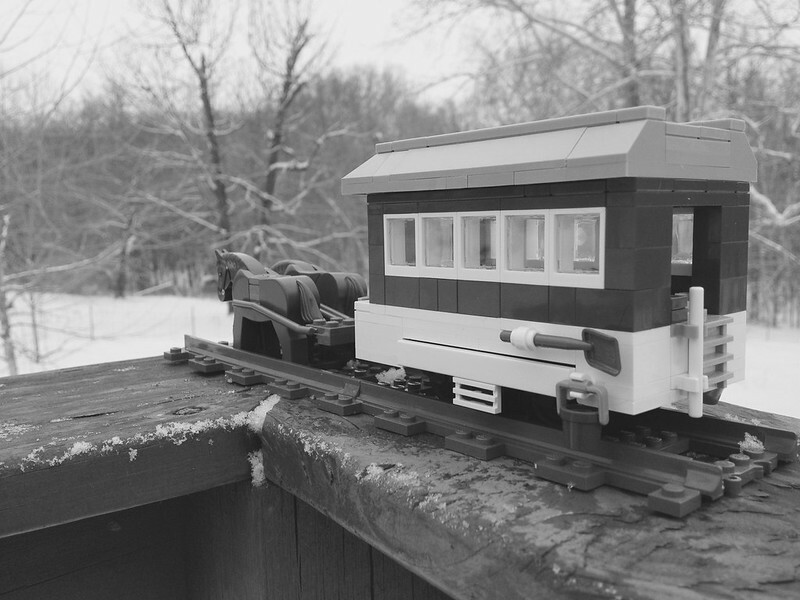 These were light vehicles with a narrow gauge. As the track were laid on dirt and bare rock derailments were a common occurrence. When these happened the male passengers were expected to disembark and shove the carriage back onto the track while the females remained inside. 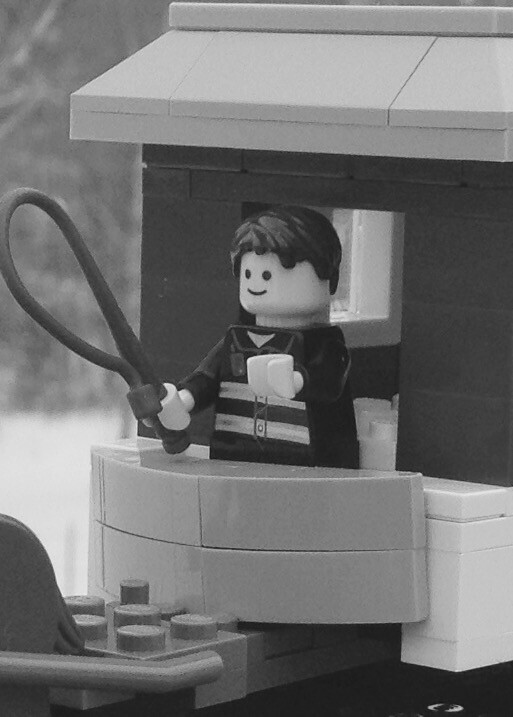 During later years the revenue from tickets would reach $250,000 and the proceeds from the sale of Manure $10,000 - so I had to ensure that I included the obligatory bucket and shovel. Drivers were expected to work 15 hours a day, 7 days a week in all weathers in an open carriage for about 8c/hour pay. The horses were luckier in that they were worked for 4-6 hours through the day. Given the working conditions the smile on this guy seems a little too fixed. 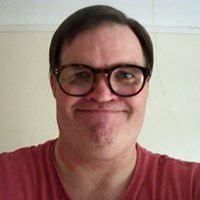 Comments, criticism and ridicule welcome! That's awesome a type of train you rarely see inlego! Great work! Nice work. You beat me to it. I was planning a horse drawn trolley too. I think some roof overhang and taper at the rear wouldn't hurt. It'll give symmetry with the front and not have that car chopped in half abrupt look. I think you're right about the overhang at the rear. 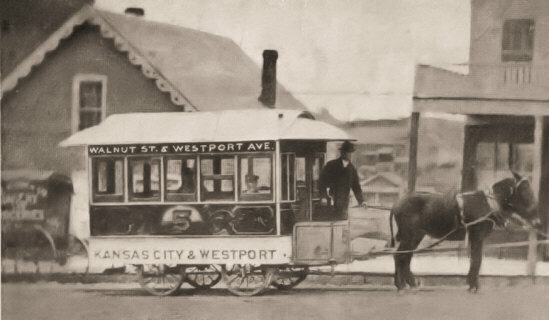 I was reading a book about the history of transportation in Kansas City and they described the rear (of this horse wagon) as being open to the elements and with only a ladder to gain entry (i.e. 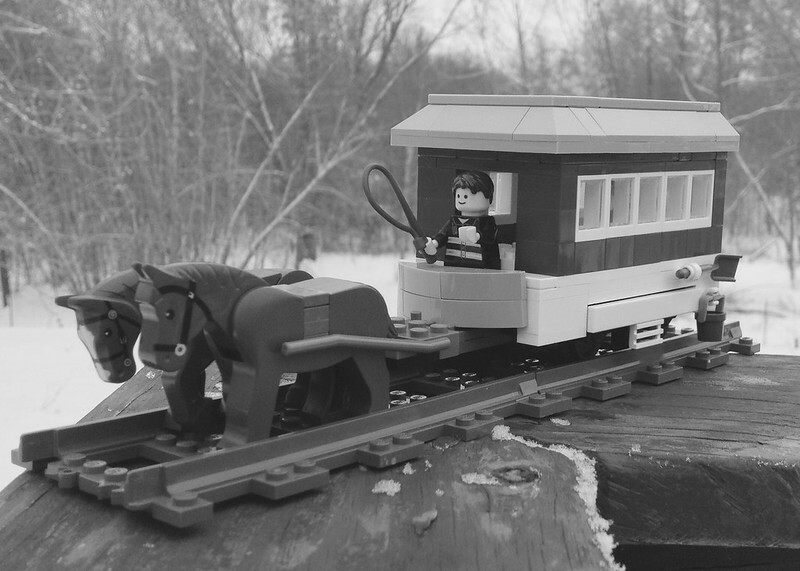 no platform), but I did find an image of a similar looking horse car from Rochester, NY 1867 where the rear overhang is more obviously there. Nice little streetcar. The black and white helps set the stage.